1stAmender - What Are Crushed Red Pepper Flakes? In layman terms, what kind of pepper(s) are these crushed red pepper flakes coming from? Red pepper flakes are in every pizzeria across America, but what the heck kind of peppers are these anyway? Jalapeños? Pepperoncini? Anaheim? One thing’s safe to say: they’re certainly not bhut jolokia or the Trinidad Moruga Scorpion (the excruciating pain would clue you into the fact that you’d just eaten seeds and flakes from the hottest peppers in the world). Who better to ask than McCormick, which has been dealing with spices since it bought the F. G. Emmett Spice Company of Philadelphia in 1896. In this interivew, part of a series attempting to solve the mystery of pizza and pepper flakes, Dave Mixon, director of quality for the U.S. Consumer Products Division for McCormick, talks about crushed red pepper flakes, their composition, origin, and heat level. 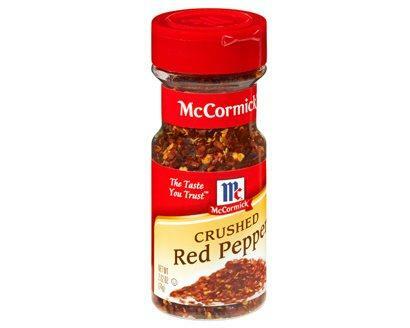 McCormick’s spice dictionary lists the Crushed Red Pepper, the kind you typically see in American pizzerias, as Solanaceae Capsicum annum L. In layman terms, what kind of pepper(s) are these crushed red pepper flakes coming from? Don’t get confused by the Solanaceae and the "L." Capsicum annum is an entire group of red peppers that includes paprika, cayenne, jalapeños, and bell peppers. But it’s broken up beyond that. What you can do to make it easy on yourself is to refer to the full list of capsicum cultivars. The crushed red pepper would be an example of the cayenne style, and that’s a very broad group. So it’s not just necessarily one pepper? The type most often used is the cayenne species. But other peppers could be used, too. There are jalapeños in this group, for example. It’s more of a mix. Depending on what companies you’re making it for you might have to meet certain heat units. So depending on the type of Scoville heat you want for your customer you might have to blend in some chiles. You might include Dundicut peppers, for instance, and mix those in with some Anaheimsor serranos to meet the heat range of your customer’s specs. They might want to have more than one type in there. There’s a documentation of first-generation Italian-Americans using red peppers when they first arrived in America in ways that they did in Southern Italy. Can we say that these are probably the same peppers as used in the blend of flakes? They’re probably in that capsicum variety, species, and group. There’s a whole host of them. There are 30 types of capsicum annum peppers including the jalapeños, Anaheim, pepperoncini, poblanos, and all kinds of serrano. Some of them started out exclusively in Central America and were transferred around the world. Did you know that red pepper originated in the Western Hemisphere? They were native to Central and Southern America. Christopher Columbus brought them back, and from there they spread to the rest of the world, though, these things have such variety to them that they could have developed on their own from some kind of fruit pod. So not only are the typical red pepper flakes not just from one pepper, but they usually contain more than one kind? Generally, it’s a blend of three or four peppers in the range of 30,000 to 50,000 Scoville units. It could be any number of peppers depending on the availability of the peppers and their heat level — availability from an agricultural standpoint. We get a lot of peppers from India, China, and the United States. So in terms of the blend, it’s kind of like wherever we’re getting the peppers from, their availability, and their heat level. If we can source from India, where they have multiple varieties, they can do the blending where the raw materials are processed.